The Anti-Defamation League offers several programs aimed at ending bigotry, racism and genocide. The A World of Difference® Institute is a leading provider of anti-bias education and diversity training programs and resources. The Institute seeks to help participants: recognize bias and the harm it inflicts on individuals and society; explore the value of diversity; improve intergroup relations; and combat racism, anti-Semitism and all forms of prejudice and bigotry. The Philadelphia regional office first implemented No Place for Hate® as a community-based initiative in 2001, and in 2005 the program was adapted to meet the needs of schools. 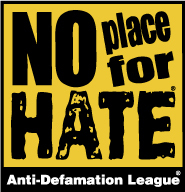 No Place for Hate® enables schools and communities to challenge anti-Semitism, racism, hatred, and bigotry in all forms. By providing a model for responding to and preventing acts of hatred, No Place for Hate® is an innovative and powerful method for reducing bias and bullying, increasing appreciation for diversity and building communities of respect. No Place for Hate® was officially endorsed by the Governor of Pennsylvania in the Fall of 2006 and is active in 160 schools throughout the Commonwealth. Current Media Partners are WPVI-TV, The Philadelphia Inquirer, Clear Channel Radio, and Daily News. The Braun Holocaust Institute's programs for educators, students, community leaders, and families explore the enduring impact of the Holocaust and apply its lessons to contemporary issues of prejudice and moral decision making. Through these efforts, the Institute hopes to ensure that the Holocaust—and the brutality that humankind inflicted upon itself—is never forgotten. An annual Bearing Witness™—Anti-Semitism, the Holocaust and Contemporary Issues program, a four-day residential program held at Daylesford Abbey that brings together Catholic -school educators and administrators from dioceses across Pennsylvania and Delaware to learn about the historical relationship between the Jewish and Catholic communities, the history of anti-Semitism, the role of the Church during the Holocaust, recent changes in Church teachings on Jews and Judaism and issues of stereotyping and prejudice in contemporary society. In partnership with the Archdiocese of Philadelphia and working specifically with a committee that includes Sister Judith Kreipe and Josey Fisher, Carol Cary from the Office of Catholic Education, and a number of ADL lay leaders and past Bearing Witness™ participants, this program is beginning its 4th year. To date, the regional Bearing Witness™ program has hosted 89 Catholic-school educators representing 61 different middle and high schools. Thirty-two new Catholic-school educators are registered to attend this summer's program from July 27 - 30. ADL, the USC Shoah Foundation Institute, and Yad Vashem jointly developed the Echoes and Reflections multimedia Holocaust education curriculum for secondary school classrooms. It provides instruction on the history of the Holocaust within the context of contemporary issues of cultural diversity, intolerance and genocide. Integrated into 10 multi-part lessons, Echos and Reflections includes primary source materials such as photographs, artwork, diary entries, letters, poems, maps and government documents, as well as 2½ hours of visual history testimony by Holocaust survivors, rescuers and other eyewitnesses. An accompanying full-day Teacher Training program is available.